Acting with these five dispositions a lay-disciple is practicing falsely, a shadow of a lay-disciple, a lay-disciple in name only. What five? They do not have conviction for the value of an awakened bodymind; are without virtuous character; seek out the protection of charms, chants and the comfort of ceremony; believe that charms, chants and ceremony are cause rather than their own actions; and offer their wealth and skills only to heighten ego. Acting with these five dispositions, a lay-disciple practices falsely, is a shadow, is a disciple in name only. Acting with these five dispositions a lay-disciple is aware of the Three Jewels, accepts the Pure Precepts, realizes the actions inherent in the Four Ennobling Truths. What five? They have conviction for the value of awakened bodymind; develop a virtuous character; see beyond the delusion of charms, chants and ceremony to their value as reminders of intent; know that what they do matters is revealed in karmic consequence; offer their wealth and skills selflessly for the benefit of others. Acting with these five dispositions, a lay-disciple practices the dharma, is an example of the dharma, is a fully realized disciple. NOTE: Know that I’ve taken the liberty to put this important sutra into contemporary language and have used the buzz-words of the Pragmatic Buddhist tradition. Venerable David and myself have often discussed if any of sutras re-worded (or creatively re-described) in such a way could offer the same intent as the those translated directly from the Pali, and holding to the symbology and textual references of that time 2600 years ago. Using the sutra as translated by Thanissaro Bhikkhu – “Candala Sutta: The Outcaste” (AN 5.175), translated from the Pali by Thanissaro Bhikkhu. Access to Insight, 3 July 2010, http://www.accesstoinsight.org/tipitaka/an/an05/an05.175.than.html . 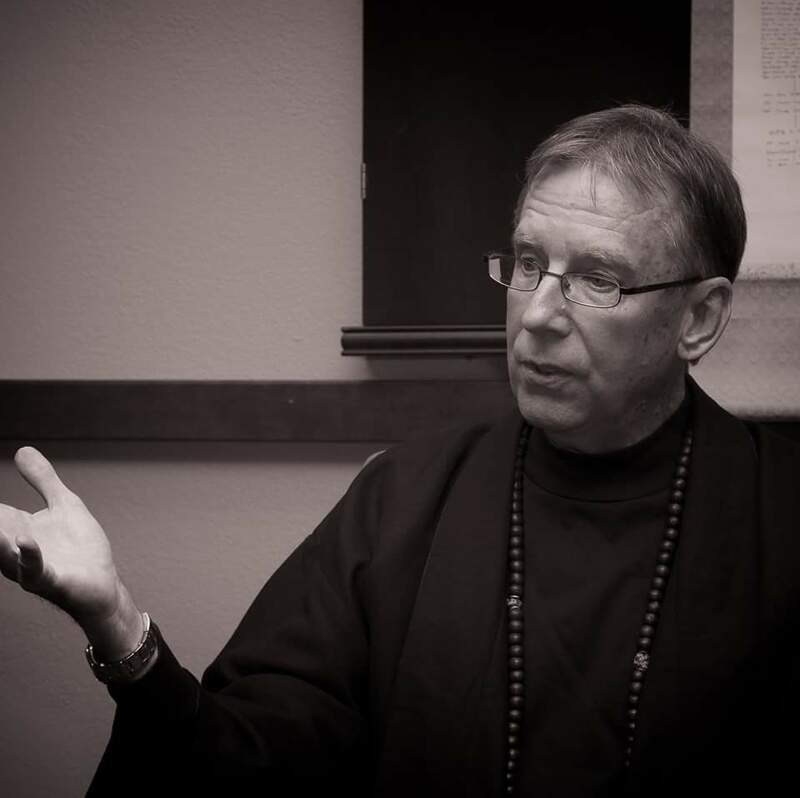 – I’ve attempted to do just that, present the sutra in a contemporary way and be true to the intent of the Buddha. Sutras teaching a direct lesson sometimes begin with a ‘slap on the hand’, focusing on what not to do or be. The negative aspects of dispositions, habits and practices come first and are then, but not always followed by the positive. 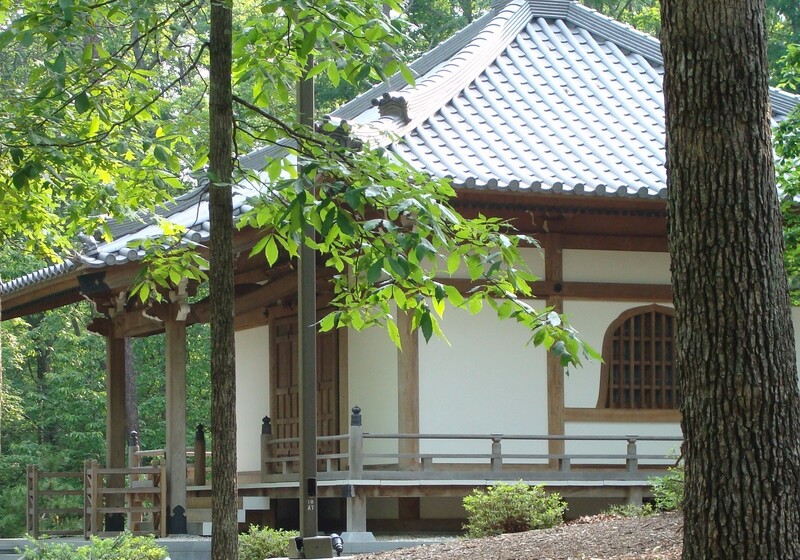 You might think that this was is only a cultural norm for Siddhartha’s time and place. Not so. Look at many Western writings, religious or secular, meant to convey lessons on behavior and character and you’re likely to encounter the negative first. What you ought not to be, followed by the ideal. Contrasting the opposites in Buddhist texts is not at all meant to show a duality of personality and action . . . instead it is meant to reveal that those contrasts exist in all bodyminds . . . in the unconscious mind are habits and dispositions we make the effort to recognize through rigorous self-honesty and follow that up with effort to practice positive transformations in the conscious mind. Transformation that will replace the negative aspects of our unconscious mind. Let’s just skip even discussing the lay-disciple that practices falsely. Instead, let’s remind ourselves of the dispositions of a fully realized lay-disciple on the path of positive transformation and liberation. 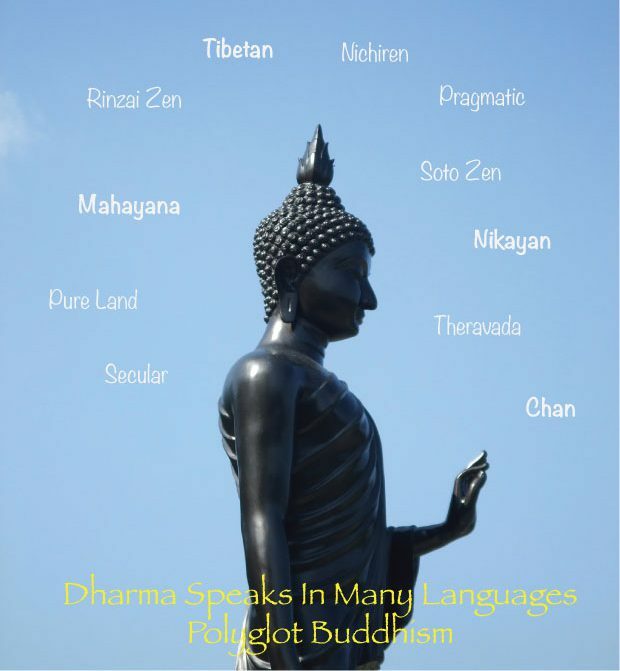 The Buddha, a human like each of us, isn’t the only example of an awakened bodymind, though he is certainly at the top of a list that mustn’t in truth include only Buddhists. 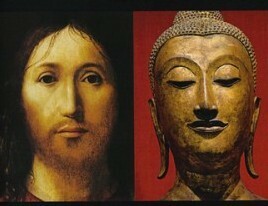 Think about Bill and Melinda Gates, Thomas Merton, Thich Naht Hanh, Venerable Shi Shen Long, Ghandi, Jesus, Mohammed . . . and even those times when you, yourself have an awakened moment . . . might not last but a flash but it has likely happened. In those moments you have the opportunity to personally realize the value of an awakened mind. In the next, and all moments to follow you have the opportunity to build your awareness and experience an awakened mind more often until an awakened mind is your natural state of being. The Noble Path is one of practicing a virtuous character until it becomes a spontaneous part of how you are. Generosity becomes spontaneous. Without thought you give of your skills, wealth and gifts to any sentient being in need. Compassion becomes spontaneous. Hatred and intolerance in any form doesn’t arise in your bodymind no matter the situation or experience. You feel an empathetic connection with all sentient beings and want them each to discover their own way out of discontent, anguish and unsatisfactoriness. All the virtues of moral ideals and ethical behaviors become your ‘go to’ thoughts and actions because you know the value of a virtuous social self. 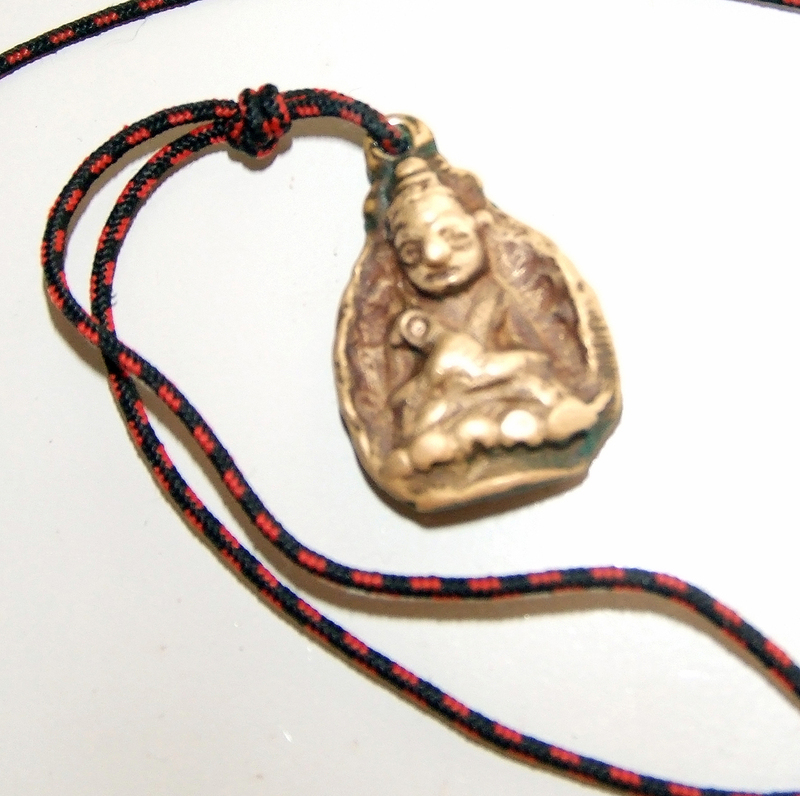 Everyday I wear a brass amulet depicting the Buddha. It was made in Vietnam during the latter years of that horrible war. I don’t wear it for protection from anything. The weight of it against my chest is an intentional reminder of the horrors of violence, the suffering of others, and of the path I’ve chosen to walk. Reliance on charms weaken personal responsibility. Every morning I chant the Heart Sutra. The words, the tone, the rhythm combined are an intentional reminder of compassion, the serenity that comes with acceptance, and the importance of mindfulness for an awakened mind. 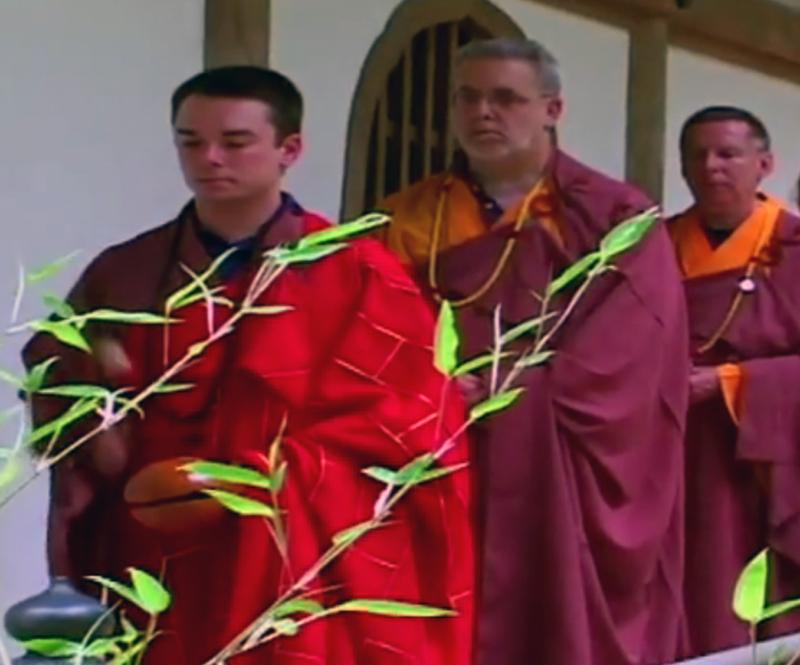 Belief that ceremonies allow contact with higher beings weakens personal responsibility. Before each meal I silently recite to the causal Universe: ‘I honor all living things who gave their lives and all beings whose efforts brought this food before me. 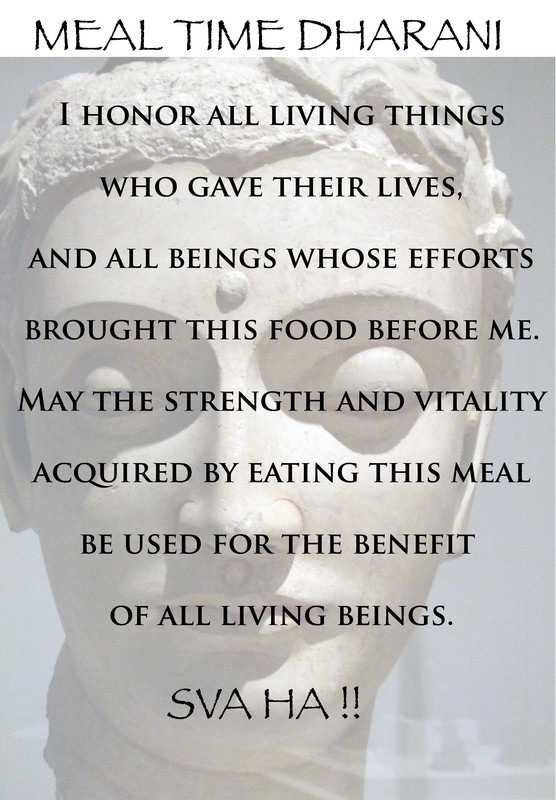 May the strength and vitality acquired by eating this meal be used for the benefit of all living beings. 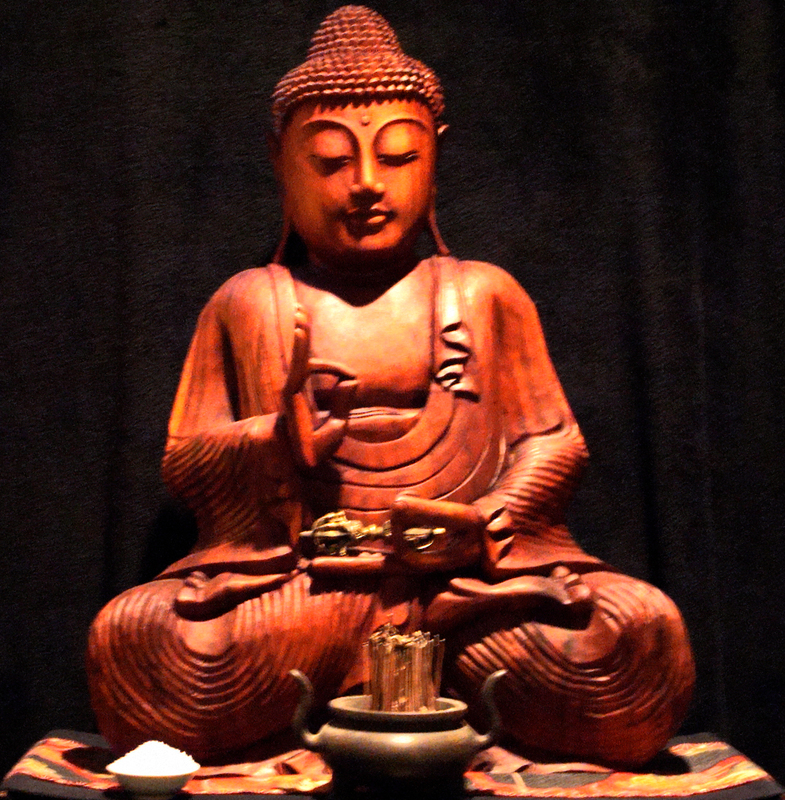 Svaha!’ This dharani, or prayer, isn’t being said to the Buddha. It is being said to me, to remind me that honoring all whose efforts keep my bodymind alive is an action of a fully realized awakened mind. An object, a sound, or a recitation does not have any intrinsic power to affect change. Their only power is in triggering intentional practice. Whether it is bowing, chanting or lighting a stick of incense you are engaging in a ritual of intent. You are awakening your mind to the potential in each moment. This is a traditional and contemporary view in Chan Buddhism that all of your effort in practice is toward unleashing that potential. Mindfulness of your thoughts and actions in each moment arises as you come to recognize that those thoughts and actions are both cause and effect. Cause and effect that have karmic consequences that will not be experienced by you, but will become part of the karmic web of potential. Awareness that what you do in each moment matters is how a fully realized disciple views their thoughts and actions. Generosity of spirit without expectation of personal gain is a virtue realized by all disciples. At the end of each sangha session ‘sharing of merit’ is recited beginning with – Showing our gratitude and generosity, practicing the way of awareness which gives rise to benefits without limit, we vow to share these benefits of our practice, service, and gifts with all beings. – words meant to remind each practitioner of the immense value that comes with generosity of spirit. With these five dispositions – faith in an awakened bodymind, virtue, intentional action, awareness of karmic consequence, and generosity of spirit – you are a fully realized Buddhist lay-disciple. You look to the Buddha, the consummate teacher; the Dharma, the consummate teachings; and the Sangha, the consummate gathering of spiritual friends. Your intent in all thought and action is to cease to do harm, do only, and do good for others. And, you recognize that the Four Ennobling Truths are calls to action to accept, to learn about, to practice compassion through taking intentional actions.You are a fully realized lay-disciple.